The effective interest rate for April 2018 Singapore Savings Bonds gives you an effective interest of 2.31% if you hold it for 10 years. That will be a total of S$2,340 of interest collected if you purchase S$10,000 of Singapore Savings Bonds now. Here is a previous post I did to compare the returns of the Singapore Savings Bonds against our normal savings account and traditional Time Fixed Deposits (Singapore Savings Bond versus Savings Account versus Fixed Deposits). Overall, the Singapore Savings Bonds emerge as the winner with the highest returns. Of course, the returns may not be fantastic if you compare against stocks or other investments of higher risk. But the Singapore Savings Bonds serves well as a contingency fund and as a war chest as well. 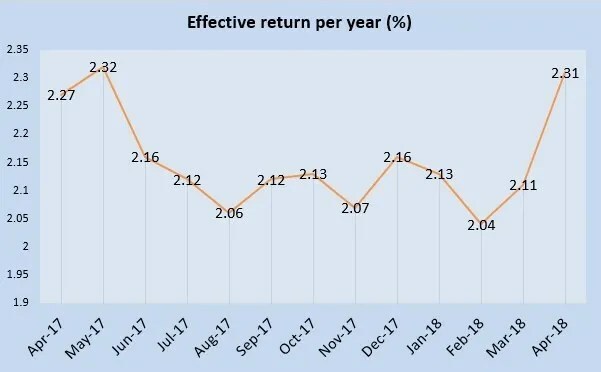 I have bought the Singapore Savings Bonds in October 2015 and September 2017 where the effective interest rate is 2.63% and 2.12% respectively. The best thing about Singapore Savings Bonds is that you can sell the existing bond of lower effective interest anytime and swap it with another one as it has no lock in period. If you are like me where I am on a lookout for a good steal in the stock market but still have not spotted any, you can consider parking your money with Singapore Savings Bonds and collect interest while you wait for the next stock market crash!